The following guidelines will help your care and protect your beds, maximising the life of your bed investment. Hypnos takes pride in supplying a range of supremely comfortable beds and sofa beds, helping to create a safe, healthy and hygienic sleeping environment that will have a positive effect on a guest’s well-being and satisfaction. The following guidelines will help you care for and protect your beds, maximising the life of your bed investment, whilst helping to provide guests with a relaxing and comfortable night’s sleep. ✅ DO seek assistance when handling the mattress - they can be heavy; we recommend two people for this. ✅ DO air the mattress before covering with a mattress protector and bed linen - this allows the 'new mattress smell' to dissipate. 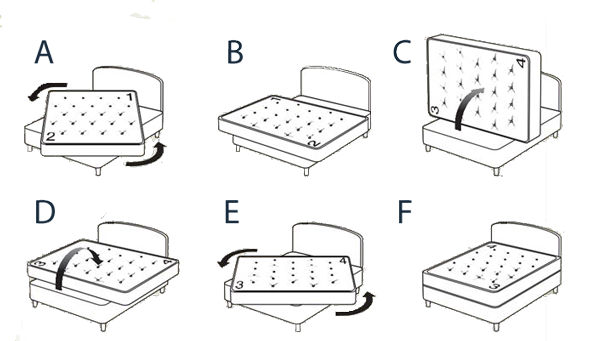 ⭕ DO NOT bend the mattress - with the exception of sofa bed mattresses, this will damage the mattress. ⭕ DO NOT remove any tags - they contain vital information. ⭕ DO NOT use excessive force when fitting divan legs / castors / glides / link bars - they should be easy to fit. ⭕ DO NOT place a new mattress on an old divan base - they may invalidate the guarantee and will affect the feel and comfort of the bed. ✅ DO treat stains and spills with dry towels or paper towels. ⭕ DO NOT attempt to clean or reuse mattress after urinary saturation - discard the mattress as permanent, untreatable damage will have occurred. ⭕ DO NOT attempt to spot clean the mattress by and wet or damp means - this risks diluting or even removing the fire retardant qualities of the mattress fabric, which has been treated to comply with BS 7177 (crib 5) to satisfy the law for hotel use. ✅ DO separate zipped mattresses before rotations and turning - this avoids putting stress onto the zips. ✅ DO consider the use of Zip & Link beds - they will increase rooms flexibility and usage. ⭕ DO NOT leave sheets, duvets or pillows on a sofa bed when folding it away - otherwise, this will damage the metal bed action.